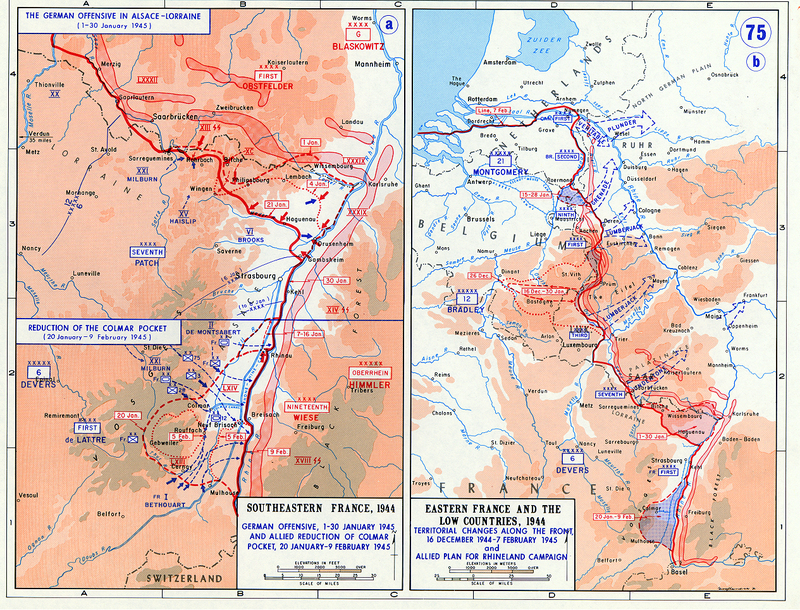 Allied campaign to capture Alsace from German forces. Formidable barriers to the east and west protected the plains of Alsace from invasion; to the east was the Rhine River and to the west the Vosges Mountains. The two primary gaps in the Vosges were the Belfort Gap and the Saverne Gap, with the former defying capture by the German army both in 1870 and 1914. The vaunted Wehrmacht did what past German armies failed to do when Panzer Group Guderian penetrated the Belfort Gap in the French Campaign of 1940. German forces occupied Alsace until the Allied campaign of winter 1944-1945. The Alsace Campaign was a joint American-French campaign to capture Alsace and reach the Rhine River. Lieutenant General Jacob Devers, commander of the Allied 6th Army Group, exercised overall control of the campaign. His forces consisted of the U. S. Seventh Army under Lieutenant General Alexander Patch and the First French Army under General Jean de Lattre de Tassigny. The VI and XV Corps made up the Seventh Army, and the First French Army consisted of the I and II Corps. Opposing was the German Nineteenth Army under General der Infanterie (U. S. equiv. lieutenant general) Freidrich Wiese. His army consisted of eight infantry divisions, six of which would be nearly destroyed in the campaign. Wiese’s most reliable unit was the 11th Panzer Division (known as the Ghost Division for its fighting on the Eastern Front against the Soviet Union). Ultimate control of the German forces, however, was in the hands of Army Group G Commander General der Panzertruppen (U. S. equiv. lieutenant general) Hermann Balck. Supreme Headquarters, Allied Expeditionary Forces (SHAEF) had low expectations for the campaign in Alsace; its attention was more clearly focused on the battles to the north involving the 12th and 21st Army Groups. General Devers was to clear the Germans from his front and secure crossings over the Rhine River. In the 6th Army Group zone, General Patch’s XV Corps, commanded by Major General Wade Haislip, held the left, or northern, flank and was linked up with Lieutenant General George S. Patton’s Third Army of the 12th Army Group. Next in line was the VI Corps under Major General Edward Brooks, who took over when Lieutenant General Lucian Truscott was reassigned. Holding the southern flank was the First French Army; this was also the southern flank of the entire Allied line. The campaign in Alsace was to begin in coordination with the fighting to the north. The XV Corps was to jump off on 13 November 1944 and capture Sarrebourg and the Saverne Gap, then exploit its gains eastward while at the same time protecting Patton’s flank. 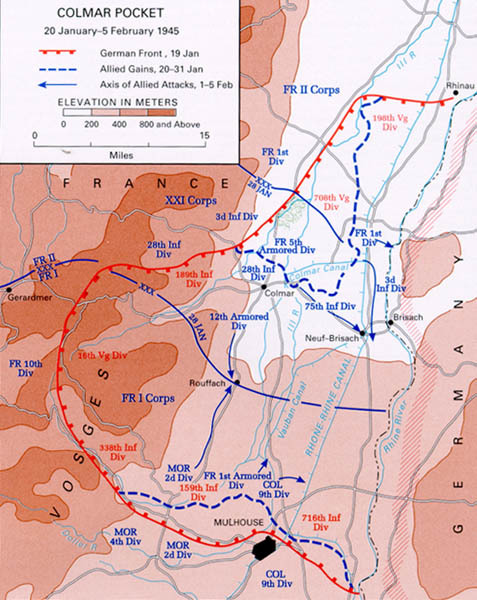 (Patton’s offensive started on 8 November.) The VI Corps was scheduled to begin its campaign two days after the XV Corps started, or 15 November. It would attack in a northeasterly direction, break out onto the Alsatian plains, capture Strasbourg, and secure the west bank of the Rhine. Farther south, the First French Army was to commence operations on 13 November. The I and II Corps would force the Belfort Gap, capture the city of Belfort, and exploit its success. There was ample opportunity for spectacular success. The XV Corps attacked in a snowstorm on 13 November with the 79th and 44th Divisions and the French 2nd Armored Division. The 79th Division captured Sarrebourg on 21 November and advanced so quickly that General Patch directed XV Corps to capture Strasbourg if it could get there before VI Corps. On 23 November, elements of the French 2nd Armored Division liberated Strasbourg, capital of Alsace. The VI Corps began its attack on 15 November with the 3rd, 36th, 100th, and 103rd Divisions and achieved similar success. Crossing the Meurthe River, the 100th Division penetrated the German “Winter Line” on 19 November, a position that quickly crumbled. The attack in the First French Army sector began on 13 November. The French troops successfully breached the Belfort Gap, and elements of the 1st Armored Division of I Corps reached the Rhine on 19 November, the first Allied troops in the 6th Army Group zone to do so. In the midst of this success in the 6th Army Group zone, Generals Dwight D. Eisenhower and Omar N. Bradley met with Devers and Patch on 24 November. The result was an order for the Seventh Army to turn northward and attack the West Wall (the series of fortifications protecting Germany’s western frontier) along with Patton’s Third Army. The XV and VI Corps, minus two divisions, were subsequently turned northward while the First French Army and the 3rd and 36th Divisions focused their attention on German troops around the city of Colmar. The attack northward began on 5 December, with the XV Corps on the left and the VI Corps on the right. After 10 days of heavy fighting, elements of the VI Corps entered Germany on 15 December. The 100th Division’s effort around the French city Bitche was so fierce that it was given the sobriquet “Sons of Bitche.” The Seventh Army offensive was halted on 20 December to enable it to cooperate with the Allied defense in the Ardennes. The German troops in the 6th Army Group front planned an offensive for late December 1944, known as Operation NORDWIND. Just before midnight on New Year’s Eve, the onslaught commenced. Through much of January 1945, the attack forced Allied troops to give ground. Eisenhower even toyed with the idea of abandoning Strasbourg, but General Charles de Gaulle vehemently opposed such a plan. The city was held, and by 25 January, the German offensive petered out and the German forces withdrew. Colmar pocket was the German bridgehead west of the Rhine River and south of the city of Strasbourg, held by Colonel General Friedrich Wiese’s Nineteenth Army of eight divisions (some 50,000 men). On 7 January 1945, the Germans launched a major attack out of the Colmar pocket, gaining very little ground. But the Allies wanted to remove the pocket, and the task was assigned to General Jean de Lattre de Tassigny’s First French Army of 6th Army Group. On 20 January, de Lattre’s troops attacked the Colmar pocket. The French I Corps led off by attacking the southern flank. On the night of 22-23 January, II Corps assaulted the northern flank. The objective was to envelop the pocket by converging on Neuf-Brisach and the Rhine Bridge at Breisach. Deep snow along with German mines, machine guns, tanks, and artillery kept the attacks from gaining much ground. The U. S. 3rd Infantry Division, which was attached to the French, then crossed the Fecht and Ill Rivers. The Germans counterattacked, but the 3rd held them off and reinforced its bridgehead. Severe shortages of French troops led to the eventual attachment to the operation of the entire U. S. XXI Corps, composed of the 3rd, 28th, and 75th Infantry Divisions. Major General Frank Milburn commanded XXI Corps. Milburn’s XXI Corps took over the right of the French II Corps zone and the main effort to envelop the Colmar pocket from the north. The II Corps guarded its left, clearing that area to the Rhine. The attack continued. The 28th Division arrived at Colmar on 2 February, and the 75th entered the outskirts of NeufBrisach in the rear of the pocket. The U. S. 12th Armored Division was then added to the attack. On 3 February, it drove south through the 28th. Pockets of German resistance held up one arm of the attack, but the other, driving down the main road, captured Rouffach on 5 February. Other task forces surrounded the town and met the 4th Moroccan Division from the I Corps. This maneuver split the pocket. On 5 February, leading elements of the U. S. 3rd Division arrived outside the walled town of Neuf-Brisach. Early the next morning, as the Americans prepared to attack the city, they encountered a Frenchman who took them to a 60-foot tunnel that led into the town from the dry moat. An American platoon entered through this tunnel and found only 76 German soldiers, who surrendered without a fight. Before leaving the town, their officers had told them to fight to the finish. French forces finished off the pocket on 9 February. In the entire operation, the Allies had sustained about 18,000 casualties and the Germans between 22,000 and 36,000. Only the 708th Volksgrenadier Division, evacuating the pocket on 3 February, escaped reasonably intact. The German 2nd Mountain Division had 1,000 battle casualties and 4,700 men taken as prisoners. Only 500 members of the German 198th Infantry Division and 400 men of the German 338th Infantry Division managed to escape. 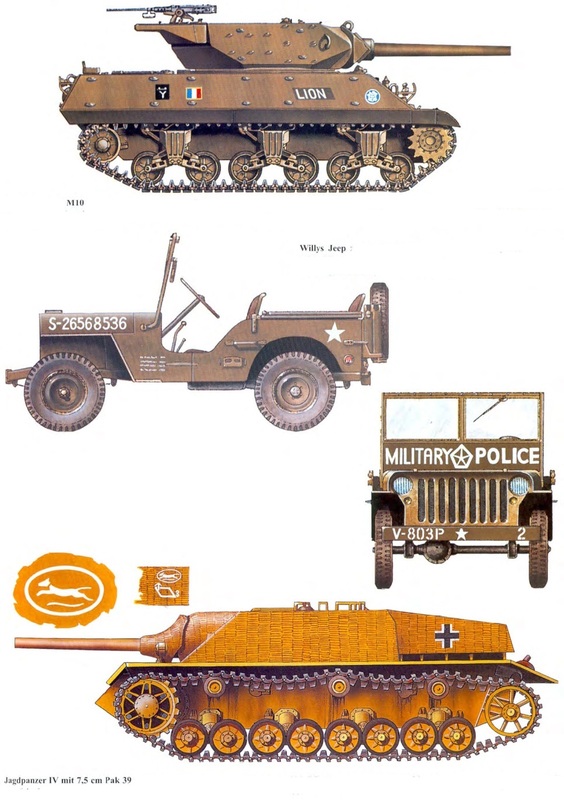 The Germans also abandoned 55 armored vehicles and 66 field pieces. The campaign in Alsace was over. Although overshadowed by the 12th and 21st Army Groups to the north, General Devers’s 6th Army Group had contributed an important accomplishment.